A collagraph print is made from a surface on which collage elements and texture have been applied. We will create our plates using Golden mediums and encaustic wax and print with Golden Fluid Acrylics. You will create colorful, textured, one-of-a-kind prints using multiple plates. 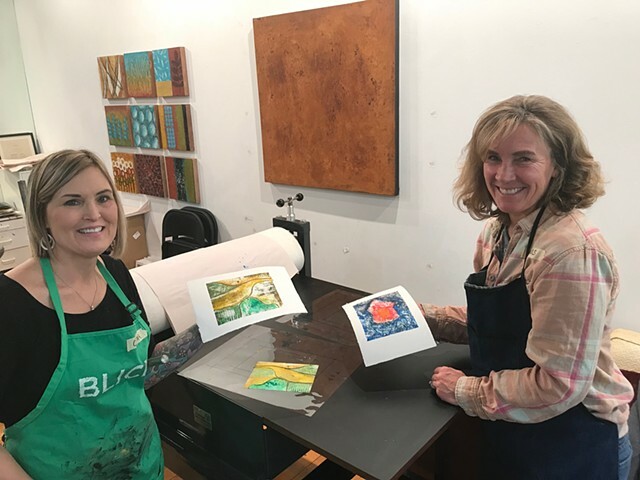 This is a very direct, painterly and fun way to make a print on paper with an embossed surface using the press. Both the making of the plates and the inking process allow for endless possibilities. We will focus on gaining a sense of layering, transparency, and texture building. This low–tech approach to printmaking will produce stunning qualities and rich color combinations. All levels welcome and all art supplies are included. Register by calling Jodi at 612/247-1244 to hold your spot and confirm payment. In this one-day workshop, you will create painterly monotype prints without using a press. A monotype is a one of a kind, hand-pulled print incorporating the immediacy of painting with the printmaking process. We will use Gelli and mylar printing plates with GOLDEN OPEN Acrylics. These plates allow you to create beautiful images by printing multiple layers with visual texture printed by hand. You will be delighted by the ease of making images using stencils, masks and resists. No experience necessary! All materials will be provided. Thursday, January 10th at 6:30 p.m. to 9:30 p.m.
Beginning acrylic painting workshops at my studio in the North Loop area in Minneapolis. This exciting 3-hour painting workshop will inspire you to tap into your creative side! 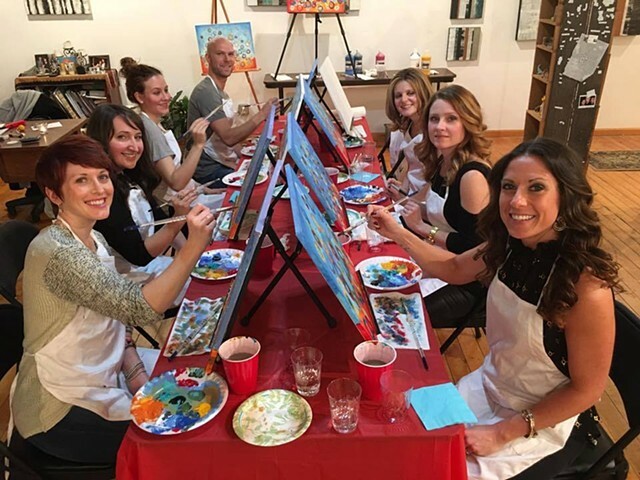 Jodi will lead you through every brushstroke to create your very own masterpiece. No experience necessary! All art supplies are provided along with nibbles and beverages! I love creating custom installations and wall sculptures that are original abstract, wall sculptures painted acrylic wall art for corporate art and commercial art installations for public, healthcare, hospitality, corporate, office and private spaces. A mixed-media visual painter painting with encaustic (beeswax) looking for good homes for her wall art installations and paintings for sale. An encaustic mixed-media painter and teacher working in Minneapolis specializing in custom art installations and wall sculptures. Visit the Kolman & Pryor Gallery to view my latest artwork! Art crawlers respond to the work of Jodi Reeb. Matt Peiken interviewed me in conjunction an exhibition at the Kolman & Pryor Gallery called Women in Art.